The article about Dennis Lynch and dam removal stated that �Blasting four dams out of the Klamath River will improve water quality and better regulate stream temperatures, according to water experts.� Mr. Lynch went on to say that he probably knows more about Upper Klamath Lake than anyone else. This is very misleading and creates the impression that all we have to do is remove the dams and everything will be okay. At present, Klamath Lake can reach temperatures at the surface in excess of 80 F during the summer months. Allowing a direct flow of Klamath Lake water directly downstream, will in most cases, can result in extreme stress to the existing fishery and to the salmon. Additionally, I would question the technical validity of how the dam removal would improve water quality in the Klamath River. While I am not opposed to the removal of the dams, it is important for governmental officials to provide what will be the required �remediation� issues and �water management changes� needed to fully restore the fishery to the Klamath River. During this drought we are faced with many hard decisions, and the creation of false hope or misleading statements is detrimental to achieving a plausible solution to water issues in the Klamath Basin. Blasting four dams out of the Klamath River will improve water quality and better regulate stream temperatures, according to water experts. �I probably have the rare distinction of being the person who has spent more time under Upper Klamath Lake than anybody else on the planet,� Lynch said. 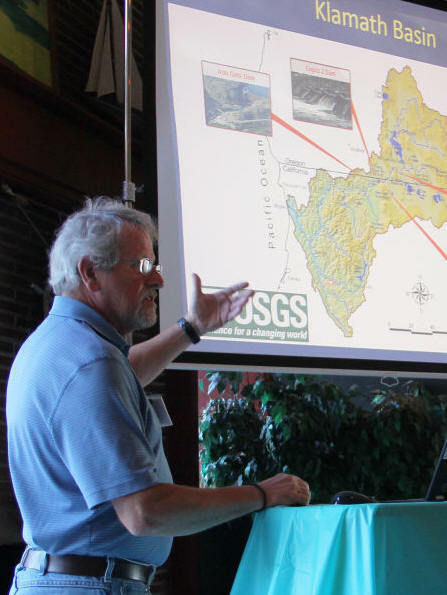 He also oversaw preparation of an Environmental Impact Statement and dozens of Klamath River federal studies related to developing a plan for dam removal, according to conference documents. Lynch�s work included determining the potential effects dam removal could have on the environment and local communities. Lynch said a cycle of Basin-wide water-related �rotating crises� are what triggered the creation of a suite of agreements cemented in the Klamath Water Recovery and Economic Restoration Act, Senate Bill 133. The bill encompasses the Klamath Basin Restoration Agreement (KBRA) and the Klamath Hydroelectric Settlement Agreement and the Upper Klamath Basin Comprehensive Agreement. The comprehensive bill aims to create a host of benefits for Basin stakeholders, including reintroducing salmon to the Basin�s upper reaches and improving riparian habitat by removing four dams � the J.C. Boyle, Iron Gate, Copco 1 and Copco 2 � from the Klamath River. He noted that two endangered sucker species � Lost River and shortnose � inhabit Upper Klamath Lake and endangered coho salmon inhabit the Klamath River. The dams do not provide fish passage and more than 300 miles of spawning habitat has been cut off from salmon species since the early 20th century. �About half of it would likely transport downstream during the drawdown process. Because it�s so fine grain, almost all of it would end up in the ocean in the first year,� he said.